Hello my darlings. Today we have such a talented and special guest. Seriously. I found Kim from Of All the Fish in the Sea while perusing Pinterest, shocker. I found an unbelievably chic and well executed design board. I clicked through to the original source and up pops Kim. After looking through all of her incredibly unique and ground breaking work, I emailed her immediately begging for her to show us more of her home. She obliged. She is kind like that. 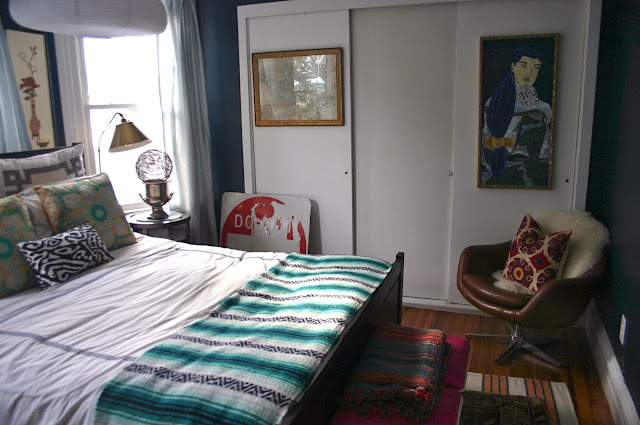 Today she is sharing her guest bedroom with us which happens to be a completely eclectic space. You know how I like that! Hi Everyone! I cannot tell you how excited I am to be here today at one of my most favorite blogs, Sadie + Stella! It was such a tough decision to choose a favorite room to share with you all. My top two design philosophies? #1) Revel in the unexpected & #2) Vintage is a way of life. 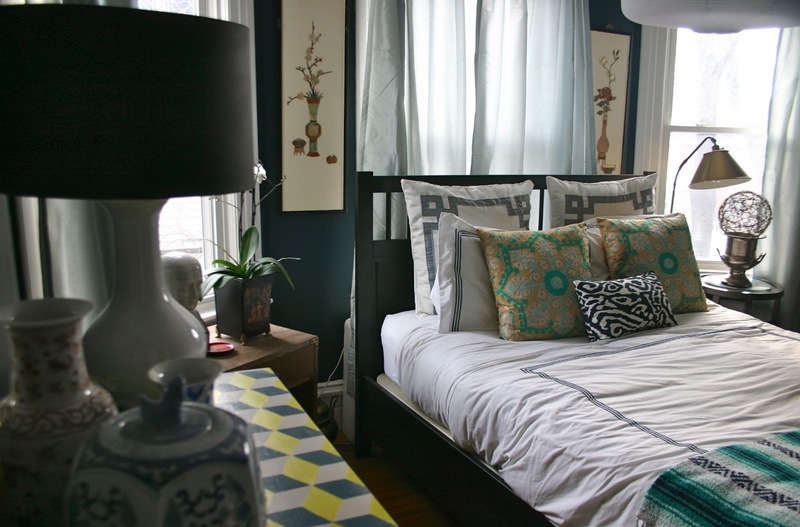 I think my guest bedroom is always one of my favorite rooms and is a perfect example of my philosophies come to life. 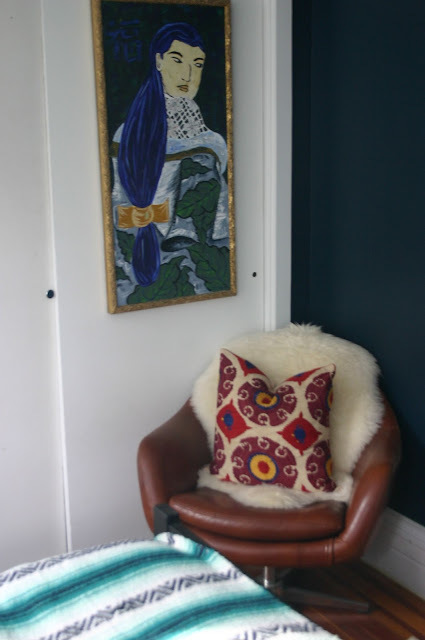 I painted the walls Farrow & Ball's Hague Blue. I love how cozy and cave-like it makes the room feel. During the day, this space gets a lot of natural light, so darker just seemed to work. The furniture is a mix of old and new. The bed is Ikea, the brown leather chair is vintage, and all of the artwork is thrifted vintage too! The tumbling block chest is a vintage piece that I refinished myself. You can read about it on my blog here. I'm not going to lie to you, it took a lifetime to finish, but it's totally worth it to have something so unique and one-of-a-kind lovely in my home! 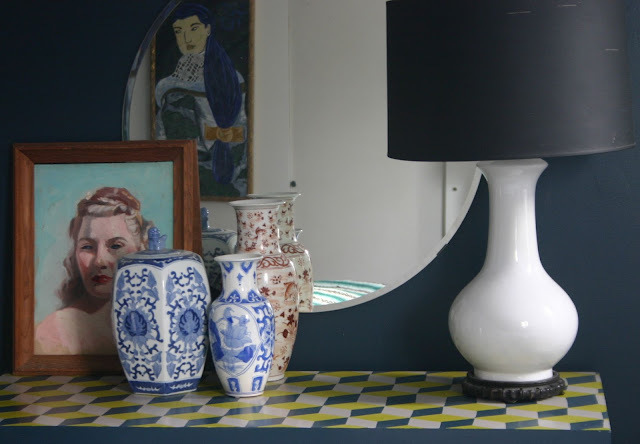 The white lamp and oil portrait are both thrifted, as well as the beginnings of my blue and white china collection. 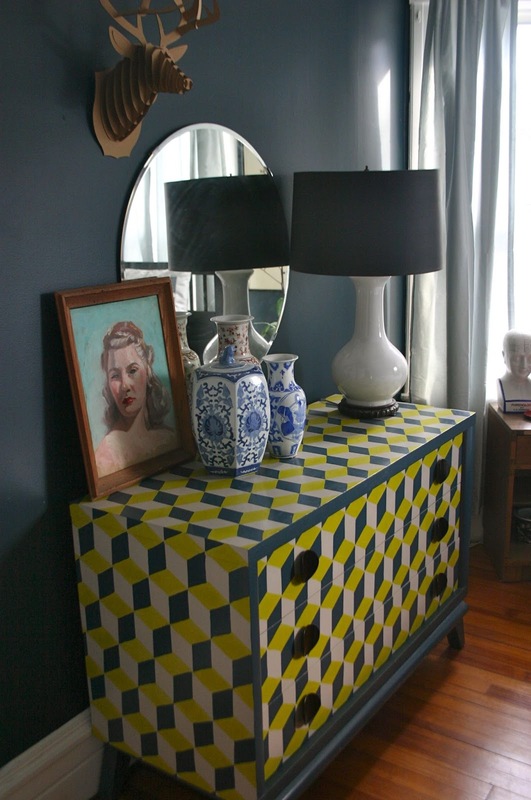 I love the juxtaposition of the modern block pattern on the chest and the Chinoiserie effect of the China together. So unexpected! 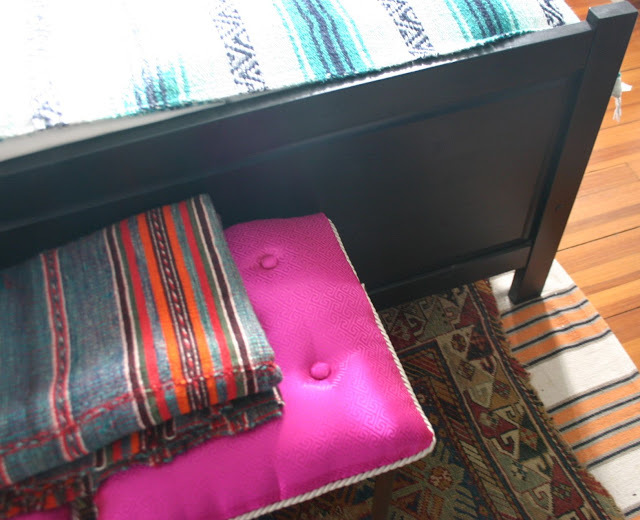 The Mexican serape throw is vintage, as well as the suzani pillow on the leather chair. The portrait hanging on the closet is also vintage. I just love the look of layered rugs, and these are two of my favorites in my whole house! The one on top is an antique Persian that was a Craigslist find, and the striped one on the bottom was $12 at Big Lots...who would have thought?! I turned two vintage snack tables into upholstered stools for the foot of the bed, you can read about it on my blog here. 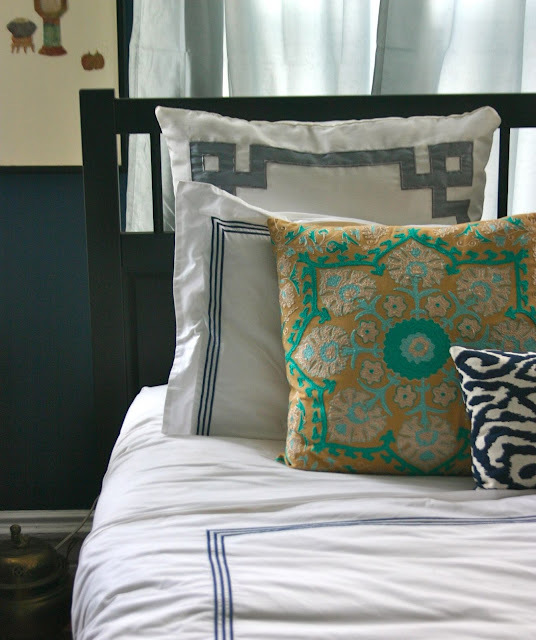 I love this mix of colors and patterns and prints - it's just too good. Really loving the bedding and the thrifted portrait! Love all of the vintage goodies in here. What a cozy guest room. Love all the patterns and textures. That dresser is amazing! Long been a fan of Kim's style and her ability to mix + match color and pattern. Another great room from her! Your mix of vintage with new is just perfect! I would love to stay in this guest room! Oh my goodness! This room is complete perfection. Love that color!! Your room reminds me if my guest room. May be time for me to repaint! LOVE this room! So eclectic and fabulous. Headed to her blog now! Love that this room has so many special finds from different places! Very eclectic, indeed! 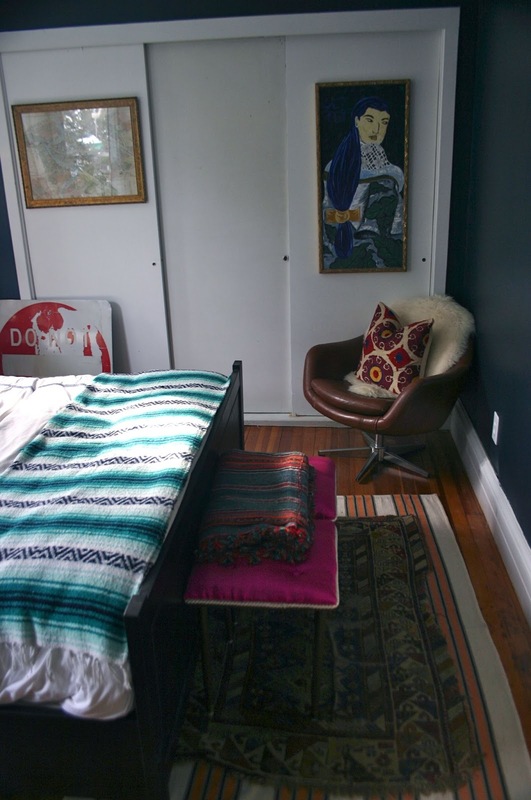 Oh how I love your room features! I love all the patterns, and that chest! Oh-my! Thats some serious dedication! I can tell that diy chest took a lifetime to do....it is killer good. You have an amazing amount of patience. Great job. The chest!!! youzzers! love it....love the ecclectic style. 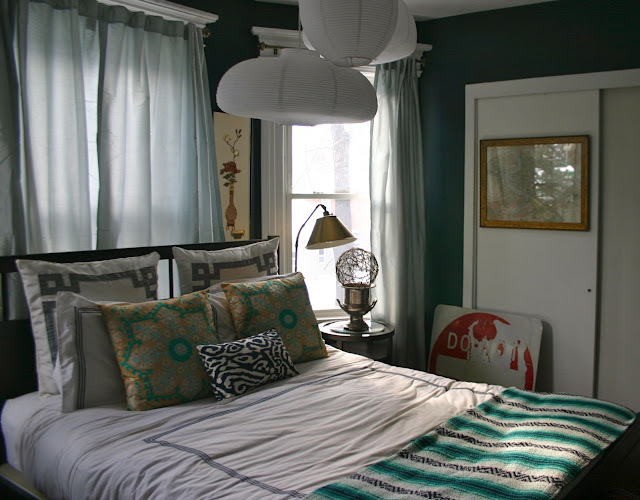 I love the eclectic vibe of the room- and the blues of course!! that chest rocks and the room is cool but still inviting! Great job! Whoa! That DIY dresser is amazeballs!